Prior to the discovery of metals, people used simple hand tools made from bone, rock and wood. Following the discovery of fire, humans learned that adding heat to certain rocks (ores) would free the metal from the rock. Eventually, the art of extracting and smelting metals and forming them into usable objects evolved—commonly referred to as metalworking. Metalworkers were valuable members of early societies. As more and more products and tools began to be made from metals, society needed more people skilled in the craft of metalworking. Objects made from metals were necessary for industry, farming, jewelry-making and defense purposes. Old coins reveal that the art of die sinking—a process that creates a cavity, or opening, of a specific size and shape for casting or forging—was known to the ancient Greeks at least back to 800 B.C. (ref: J.L Lewis, Dies and Die Making, Journal of Commerce, 1897). However, these artifacts do not show that the use of punches and dies was equally known. The first record of punches and dies being used in a machine having guides (or s) to ensure punch-die alignment appears in the 15th century, when a German locksmith used the process to manufacture hinges. In 1796, a Frenchman named DeVere earned a patent for “Dies for Punching and Drawing Sheet Metal,” perhaps the first of its kind. A significant advancement in metal-stamping operations came with the development of the progressive stamping die. 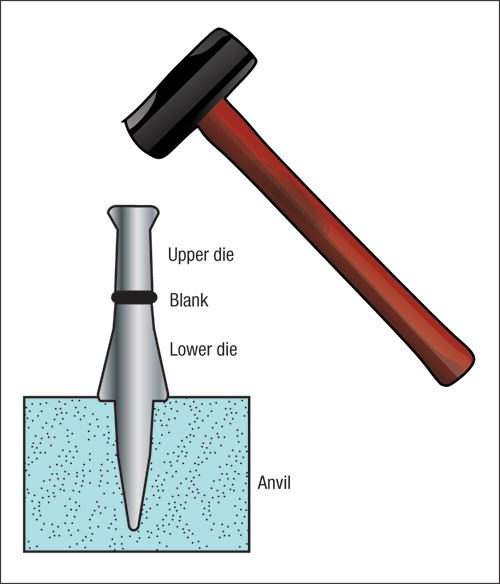 A book by Oberlin Smith titled, The Press Working of Metals (Wiley and Sons, 1896), describes “follow-on” tooling and “successive gang cutting” in a manner that suggests that they may be early predecessors of the progressive die. The 1897 book by J.L. Lewis contains the earliest published record I could find to a progressive die. The use of progressive dies during the first half of the 20th century was limited primarily to companies producing their own products in very high quantity—electric-motor components, for example. The first edition of the Die Design Handbook (American Society of Tool and Manufacturing, 1955) contains an entire chapter on progressive dies, and offers numerous examples and illustrations of progressive-die designs and die strips for such parts. After World War II, the U.S. economy surged. Most contract manufacturers of the time produced metal stampings in single-operation dies and presses. Operators hand-fed strip material into presses equipped with blanking dies. Blanks dropped into containers that were then delivered to subsequent hand-fed press-and-die forming and cutting operations. As production demand increased, speed became increasingly important. At the same time, concern for operator safety grew, as manual loading and unloading of parts from the dies created hazards. By the 1950s, single operations in single presses made it difficult to keep up with rising production demands. In 1953, Ed Stouten and his partner started a die-design business called Capitol Engineering Company, in Grand Rapids, MI. Stouten looked for s to overcome the safety, efficiency and productivity challenges related to the use of single-hit dies. He began to promote the idea of leaving some scrap material between parts to carry them in a strip through a single multistation die, a foreign concept to most tool and die shops and contract manufacturers. Many of Stouten’s customers scoffed at the idea and were unwilling to risk investing their time, money or reputations. After many attempts, he eventually found a shop owner willing to try the concept. Stouten developed a paper strip layout and showed it to the customer, who agreed to give it a try, provided that Stouten would agree to pay for the die if it failed to work. While Stouten agreed to take on the risk, the die worked as planned. But what Stouten had not planned on was how quickly word would spread about the successful use of the progressive-die concept among area shops. Soon, many stamping companies sought to run stampings in progressive dies. Die designers at the time, of course, had no idea how to develop progressive dies, so they required training. In 1970, the Grand Rapids chapter of the Society of Manufacturing Engineers (SME) invited Stouten to speak about progressive dies at its monthly meeting. Stouten asked one of his designers, Arnold Miedema, to join him at that meeting. During the next two yr., Stouten and Miedema spoke at every SME chapter meeting in Michigan, and one in Sarnia, Canada. They even crafted some drawings, for use on an overhead projector, to illustrate their concepts. This ultimately led to the development of their 266-page manual, Progressive Dies for Designers, Engineers and Managers. In 1972, SME invited Stouten and Miedema to present a three-day national seminar on progressive dies, in Dayton, OH. During the next 30 yr., the duo conducted such seminars from coast to coast, throughout the United States, Canada and Mexico, and even as far a as Singapore—a total of 133 three-day seminars. Developed right here in Western Michigan. very cool!